The following article ran last November in the new Northwest boating site, Three Sheets Northwest, to celebrate Port Townsend’s own schooner Martha’s victory in the recent Round the County race. In case you missed it, here’s the article and some pictures by Sean Trew of Pacific Fog. Martha, a schooner built in 1907, was the surprise winner of this year’s Round the County race. As it usually does, last weekend’s Round the County race included some of Puget Sound’s sleekest, fastest racing sailboats. But in the end, no amount of Kevlar, carbon fiber or high-tech design made the difference. The annual regatta around San Juan County, among the most high-profile races in the region, was won by the 102-year-old wooden schooner Martha, the second slowest boat in the fleet. The historic yacht took first in both her division and in the race overall, to the astonishment of her captain, Robert d’Arcy. “It was quite amazing,” d’Arcy said. “I’m still kind of getting over it. Whenever we race Martha with boats of her kind—older, traditional craft—she always does very well. Martha races in other regattas during the summer, ending her racing season for the past few years with Round the County. D’Arcy and the crew look forward to the race, which typically brings stronger winds—and favorable conditions for the 68-foot, 84,000-pound schooner, which doesn’t sail well to weather or in light winds. The boat, which was once owned by actor James Cagney, has a rating of 177 under the local Performance Handicap Racing Fleet (PHRF), a handicapping system that allows different types of sailboats to race against each other. D’Arcy said the crew was anticipating a good first day of the two-day regatta, with the forecast calling for strong southwesterly winds. But if the wind turned southeast for the race’s second day, the crew would have to beat down Haro Strait and across San Juan County, which would slow them down. 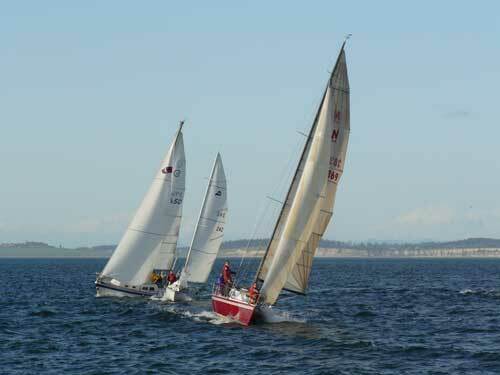 Saturday’s race started in squally conditions, with the fleet heading north from Lydia Shoal, in Rosario Strait. Rounding Patos Island before heading down Boundary Pass, Martha was keeping pace with the fastest boats. “We poured on the horsepower and we were able to hold our own with the top of the fleet,” d’Arcy said. Martha finished first overall on Saturday. That night, other racers stopped by to talk with the crew about the boat. “The old school is showing the new school a few tricks,” one commented. But day two, d’Arcy knew, would be different. The crew would likely have to tack down Haro Strait and across the bottom of the county. With her weight and size, Martha wouldn’t be able to keep up with the other boats. When the fleet reached Haro Strait, d’Arcy said, the tide was flooding and most boast stayed close to San Juan Island, beating back and forth along the shore. Martha’s crew knew that strategy wouldn’t work for them. So they headed out into the strait and away from the race course, catching a back eddy that brought their speed up to 11 knots over the bottom. Martha flew toward Salmon Bank and Lopez, Decatur and Blakely islands, arriving back at Lydia Shoal to place first in the race. At Sunday night’s awards ceremony at the Orcas Island Yacht Club, d’Arcy and his 11-member crew—which included wife Holly and the couple’s 6-year-old daughter Mary—got a standing ovation from the other racers. It was a sweet moment for d’Arcy, who in 1996 launched The Schooner Martha Foundation, which now owns and operates Martha, using the schooner for sail training programs. The recognition from accomplished racers, d’Arcy said, was gratifying.